Bentley has given the GT a styling that echoes that of the original R-Type Continental from the 1950s. The redesigned Bentley Continental GT's appearance at the Detroit auto show on Monday marked what the British automaker is calling the next step in its renaissance. Bentley's auto show appearance also marked the unofficial hand-off of company leadership from Franz-Josef Paefgen to Wolfgang Durheimer, who is scheduled to take over at the end of the month. 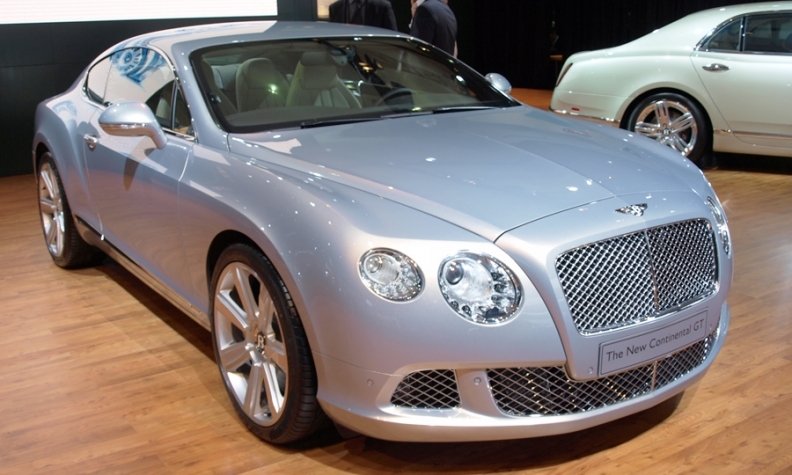 When Paefgen came to the British automaker in 2002, he worked on the launch of the first Continental GT. Paefgen is retiring but will remain with Bentley in an advisory capacity. He has worked for the automaker since 2002, and held previous positions with Audi and Ford of Germany. During his time with Bentley, Paefgen was also responsible for the production of the Bugatti Veyron. During Bentley's press conference in Detroit on Monday, Paefgen symbolically handed over the “keys to the company car” -- a 1930 8-liter, which belonged to company founder W. O. Bentley. Paefgen presented Durheimer with a plaque containing a 6-inch model of the 8-liter and the key to the real car, which is kept at the company's headquarters in Crewe, England. Durheimer is currently the executive vice president of r&d at Porsche AG, where he worked on such vehicles as the Cayenne, Panamera and RS Spyder. Durheimer will also become CEO of Bugatti and motorsports director for Volkswagen Group. It will be his responsibility to continue Bentley's turnaround. The company's U.S. sales rose 5 percent last year to 1,430 vehicles, up from 1,367 the previous year. Durheimer will take the helm on Feb. 1. The redesigned Continental GT is a luxury four-seat coupe with a new touchscreen infotainment system and extended interior design options. Under designer Dirk van Braeckel, Bentley has given the GT a styling that echoes that of the original R-Type Continental from the 1950s. It features a wider track than the previous GT and double flared exhaust tailpipes. It still boasts a top speed of 198 mph. To achieve that speed, the car also underwent a redesign under the hood. Bentley's 6-liter twin-turbo powertrain now pumps out 567 hp, propelling the GT from 0 to 60 mph in 4.4 seconds. And because it features FlexFuel technology, the GT can run on standard gasoline or ethanol. The car had its world debut in September at the Paris auto show. Later this year, Bentley will release a higher-output, 8-cylinder-engined Continental GT. In addition to the 2012 Continental GT, Bentley's auto show display includes the Continental Flying Spur with a new design package called the Series 51, and the company's flagship Mulsanne, which came out last year. The company also announced that the infotainment system featured in the Continental GT will now come standard with all Bentley vehicles.